When your natural stone has lost its luster or has become damaged in some other way, or needs to be protected, who do you look to? 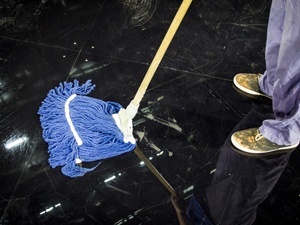 Do you look to your cleaning or janitorial company? Or should you be looking elsewhere? The fact is, stone restoration and maintenance, from chip and crack repair to deep cleaning and sealing to honing and polishing, requires specialized knowledge, training, and equipment and it is important to find the right service provider. Residential and commercial property owners and managers are often "up-sold" specialized services for natural stone by unqualified janitorial services and carpet cleaning companies. Specialized services for marble, granite, travertine, and other natural stone on floors, countertops, walls, and surfaces fall outside of the realm of expertise of regular cleaning crews. Here is what sets properly trained and qualified stone restoration contractors apart from well-intentioned but misguided cleaning and janitorial services. The properties of natural stone vary from one stone to the next. Contractors need to have a solid understanding of the properties unique to each type of stone. For example, let's have a look at granite. It is much harder than marble. When it becomes dull or scratched and needs to be refinished, there is a greater level of difficulty and special equipment necessary to get the job done right compared to marble refinishing. In fact, some stone restoration contractors who restore marble all day long, every day refuse to work with granite, because they know they would be getting in over their heads. Granite and marble are just two types of stone, each with unique properties and restoration methods, but there are many, many more examples. Unless a cleaning or janitorial service has been specially trained, they are simply not equipped to understand, let alone resolve the problems for all the different types of stone. What might you find in the back of a stone restoration contractor's work van? You might find cupwheels and diamond-impregnated pads to mount on hand tools and floor machines for grinding, honing, and polishing, steel wool and hogs hair polishing pads, gloss meters, moisture detectors, polishing compounds, poulticing materials, sealers, grout color sealers, color enhancing sealers, and other items that would leave most janitors and cleaning companies scratching their heads. In contrast, regular cleaning and janitorial crews use vacuum cleaners, squeegees, sponges and rags, mops, spray bottles, cleaning solutions, paper towels, strippers and waxes, and often, a floor cleaning or buffing machine. Although you are likely to find items used by cleaning and janitorial companies in the back of a stone restoration contractor's work van, it is highly unlikely that you would find the equipment of a stone restoration contractor in a janitor's or cleaning service's professional arsenal. Allowing anyone that is less than specially trained and experienced to resolve problems with natural stone is a risk. It is not worth saving a few bucks if you end up with serious or even permanent damage to your stone. Have peace of mind by leaving your natural stone in the hands of an expert stone restoration contractor, instead.